Brunei's Sultan Hassanal Bolkiah, left, and China's President Xi Jinping and Brunei's Sultan Hassanal Bolkiah wave to schoolchildren carrying Chinese and Brunei flags during a welcome ceremony at the Great Hall of the People in Beijing, Sept. 13, 2017. The Chinese telecommunications company Huawei Technologies’ role in the race to lay the groundwork for 5G, the latest advance in mobile telephony, has sparked concern across the Western world. The United States has pressured its European allies to avoid the Chinese telephone company, warning of “the risks that Huawei’s presence in their networks presents,” while Australia has prohibited Huawei from providing any materials for 5G infrastructure there. In Southeast Asia, however, the Chinese telephone company has received a warmer reception. No country represents this far-reaching trend better than Brunei. “Getting a foothold in any Southeast Asian country — albeit a smaller country — gives Huawei an opportunity to showcase what it can do and what is acceptable to the region,” observed Edward Tse, chief executive of the consultancy Gao Feng Advisory Company and author of China’s Disruptors: How Alibaba, Xiaomi, Tencent, and Other Companies Are Changing the Rules of Business. A Bruneian website reported in February that a Huawei executive expressed interest in bringing 5G to the Southeast Asian sultanate, proposing that the technology could increase bandwidth in Brunei to as much as 1.2 gigabytes per second for uploads and 1.4 per second for downloads. A Twitter account belonging to the Bruneian Energy, Manpower, and Industry Ministry then retweeted the article, seeming to confirm the source’s authenticity in addition to Brunei’s interest in the venture. “An expansion of Huawei’s already-considerable footprint in Brunei to include 5G infrastructure is unlikely to cause major controversy in the sultanate,” pointed out Donald K. Emmerson, editor of the forthcoming book The Deer and the Dragon: Southeast Asia and China in the Twenty-First Century and director of the Southeast Asia Program at the Walter H. Shorenstein Asia-Pacific Research Center. Given that the Swedish telephone company Ericsson has suggested that Brunei will have to wait until as late as 2022 for 5G, Huawei seems to be moving well ahead of its Western competition there. Bruneians have even taken to Reddit to complain about the potential for a delay in 5G installation. Though control over the South China Sea has fast become one of the most divisive territorial disputes in the 21st century, Brunei has done its best to sidestep this controversy. The Southeast Asian sultanate has opted to prioritize foreign direct investment over territorial integrity, declining to push the topic of the South China Sea in exchange for Chinese largess. China, in turn, has incorporated Brunei into the Belt and Road Initiative, a project to expand China’s economic sphere of influence. The Bruneian strategy has already seen some return on investment for the relationship between Huawei and the Southeast Asian sultanate. Huawei has long collaborated with Telekom Brunei Berhad, a local leader in the telecommunications industry; in fact, the partnership extends all the way back to 2004. Huawei has also invested in training the next generation of Bruneian engineers, hosting workshops in the Chinese city of Shenzhen for six Bruneian students last year. The Chinese company even seems to maintain accounts on Facebook, Instagram, and LinkedIn dedicated to its presence in Brunei. Experts have recommended a variety of strategies that Brunei could adopt to avert the possibility of future recessions, from expanding the service sector to promoting halal foods. Nonetheless, courting foreign direct investment may offer the Southeast Asian sultanate the best opportunity to wean itself off fossil fuels. Until Brunei finds another method of broadening its economy beyond the petroleum industry, Bruneian officials will likely go out of their way to please their Chinese counterparts — and Huawei. 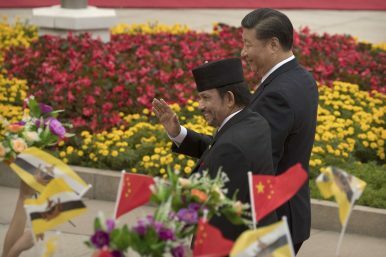 Stimuli supported by China, such as the Brunei–Guangxi Economic Corridor, Pulau Muara Besar Bridge, and Temburong Bridge, may become the future of Brunei’s economy. China Harbor Engineering Company and China State Construction Engineering Corporation, both Chinese state-owned enterprises, already have a substantial presence in the Southeast Asian sultanate. Now that Huawei has all but staked its claim to monopolizing 5G infrastructure there, the private sector in China will likely dominate the telecommunications industry in Brunei. For its part, Brunei will reap the economic rewards. Austin Bodetti studies the intersection of Islam, culture, and politics in Africa and Asia. He has conducted fieldwork in Bosnia, Indonesia, Iraq, Myanmar, Nicaragua, Oman, South Sudan, Thailand, and Uganda. His writing has appeared in The Daily Beast, USA Today, Vox, and Wired.